Bad to the bone is an understatement. 1. A gorgeous pink, white, and gold rose skull tea set. The set includes one 23 oz tea pot, two tea cups, two saucers, one creamer, and one sugar bowl. Get the set from Angioletti Designs on Etsy for $145. Available in two colors. 2. A black and purple T-shirt with a delicate lace hem, and cross and skulls illustration. Get it from Nordstrom for $50. Available in sizes 2-12. 3. An acrylic and wood skull lamp that has been laser engraved to give an awesome 3D illusion. Get it from Amazon for $120. 4. 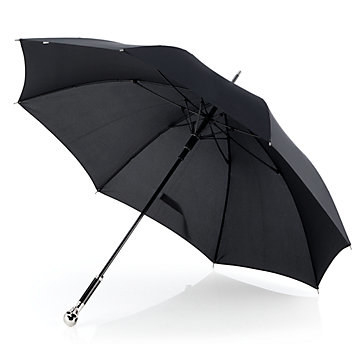 A chic umbrella with a silver skull handle. Get it from Z Gallerie for $29.95. 5. 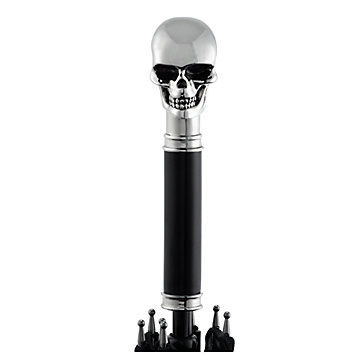 A skull USB hub you can use to charge all of your electronic devices. 6. 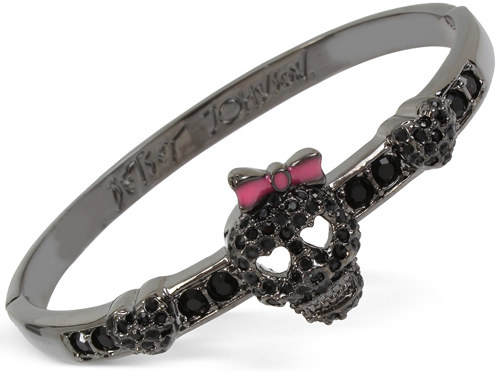 A black leather bracelet with gold skull studs or a black hinged bracelet with a skull rocking a darling pink bow. 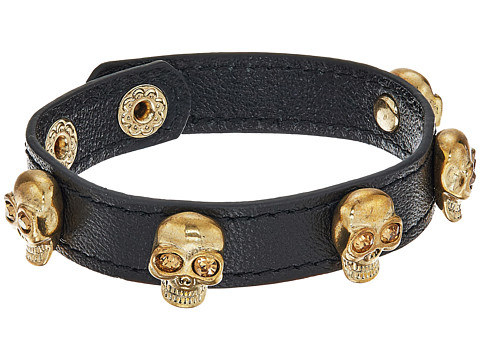 Get the skull stud bracelet from Lord & Taylor for $15.19. 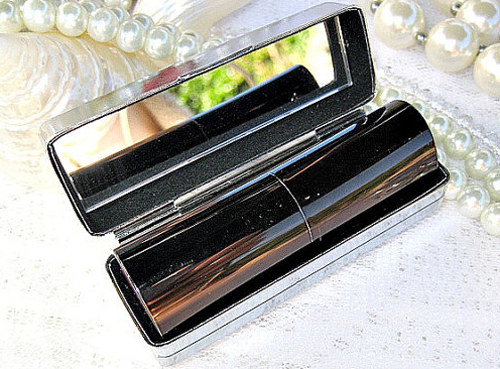 Get the hinged bracelet from Macy's for $26.60. 7. A pretty gold wine bottle stopper made from resin and stainless steel. Get it from Iron and Glory on Etsy for $30. 8. A contortionist skeleton end table that may give your guests a serious scare. Get it from Home Thangs for $193.86. 9. A glass skull decanter set that includes a pair of shot glasses. Get the set from Urban Outfitters for $24. 10. A pair of peach and white fingerless skull gloves. Get them from Torrid for $8.94. 11. A black skull jumpsuit that you can wear all year long. Get it from Modcloth for $59.99. Available in sizes S-M.
12. A beautiful skull platter made from white marble. Get it from Z Gallerie for $49.95. 13. 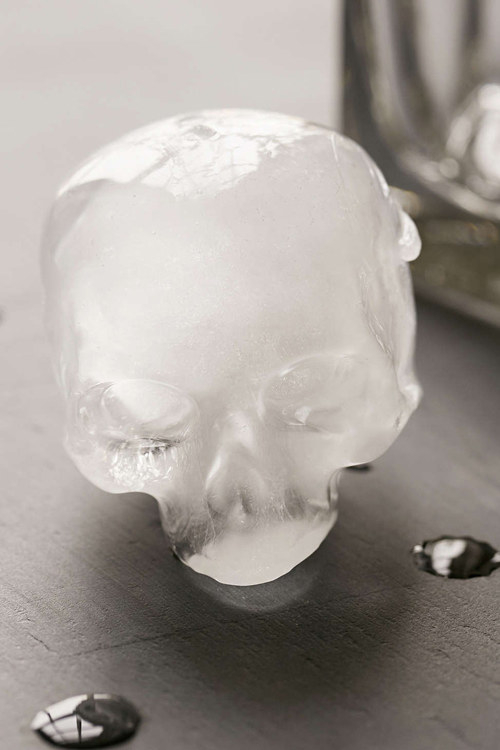 A skull ice cube mold set for some bone-chilling drinks. Get the set from Urban Outfitters for $13. 14. A Guns N' Roses tee, Metallica "And Justice for All" tee or bleached Iron Maiden tee. Get the Guns N’ Roses shirt from Macy’s for $17.99. Available in sizes S-XL. Get the Metallica shirt from H&M for $17.99. Available in sizes XS-XL. Get the Iron Maiden shirt from Hot Topic for $24.21. Available in sizes S-XL. 15. A skeleton toilet paper holder that is beyond creepy cool. Get it from Amazon for $16.20. 16. 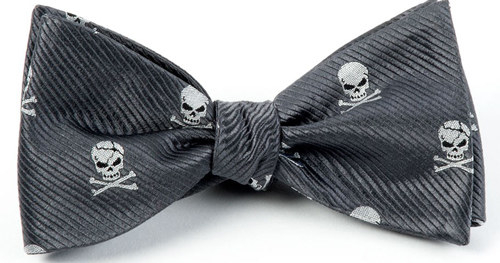 A silver skull choker with a black velvet ribbon. Get it from Nordstrom for $12. 17. 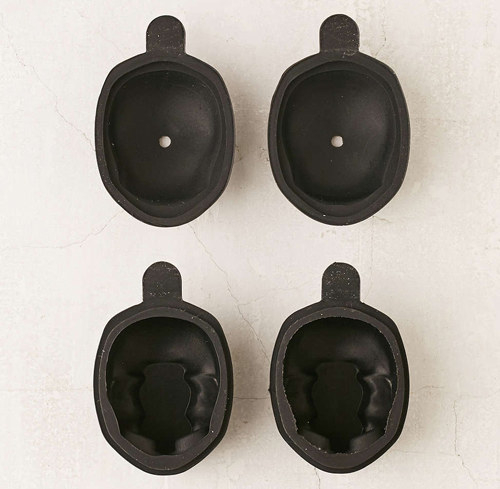 A set of silver sugar skull measuring spoons. Get it from The Roosfoos on Etsy for $35. 18. A clear phone case that features an extremely laid back skull. Get it from Casetify for $40. 19. A glowing skull and crossbones neon lamp. Get it from Lowe’s for $65. 20. A skull makeup bag with bright pink stripes. Get it from LoLo for $35. 21. 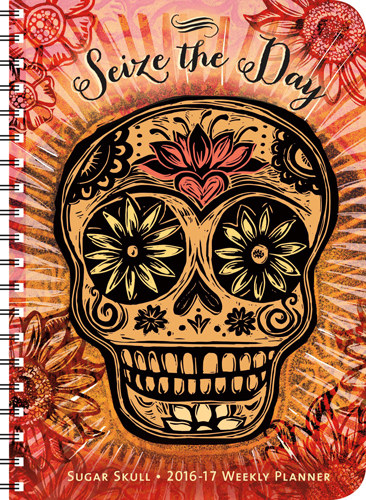 A planner with a cover decorated with flowers and a sugar skull. 22. A tasty pack of white chocolate skull lollipops. Get a six-pack from LIQNYC on Etsy for $12.50. 23. A pair of black and gold cameo earrings made for skull royalty. Get them from Macy’s for $35. 24. A unicorn skull jewelry holder with a glass to and gold horn. Get it from Modcloth for $74.99. 25. A pair of sugar skull western rain boots with pink detailing. Get them from Zappos for $45. Available in Women's sizes 6-11. 26. A set of customized moose skull bookends you can paint almost any color. Get a set from White Faux Taxidermy for $69.99. Available in 50 colors. 27. A grey tunic with a simple skull and roses graphic. Get it from Torrid for $44.90. Available in sizes 0-6. 28. A pretty bedazzled skull necklace and earrings set. Get the set from Torrid for $19.90. 29. 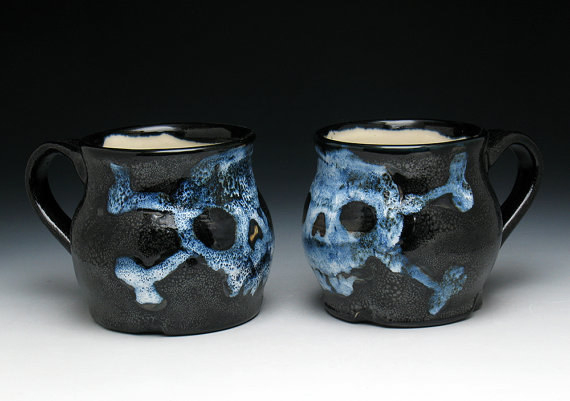 A set of black and white handmade skull mugs. 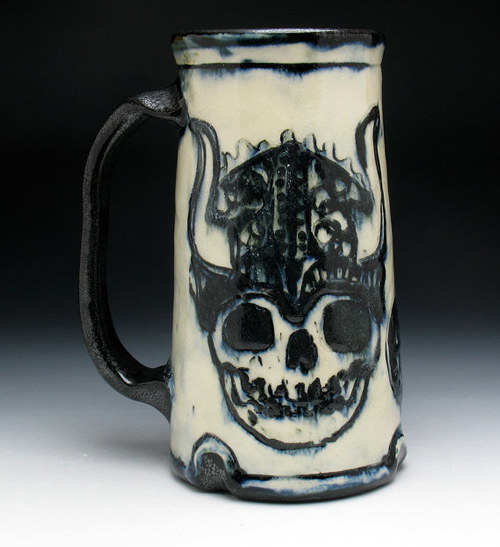 Or you can you opt for a massive viking skull beer stein that will definitely take your sipping to the next level. Get the set of mugs from Nicole Pangas Ceramics on Etsy for $76. Get the beer stein for $74. 30. An oversized skull-print scarf to rattle your accessories collection a bit. Get it from Humble Chic for $34. 31. 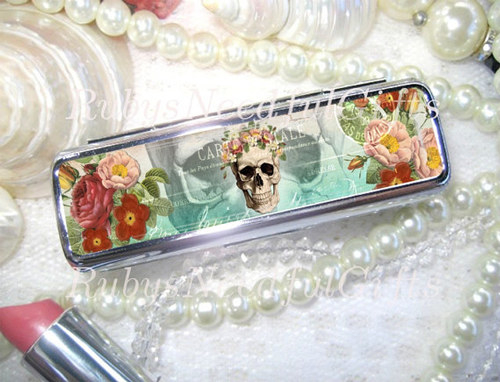 A flowers and skull case to dress up your favorite lipstick. 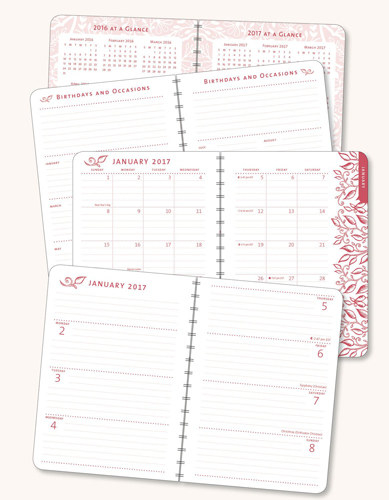 Get it from Ruby’s Needful Gifts for $13.07. 32. 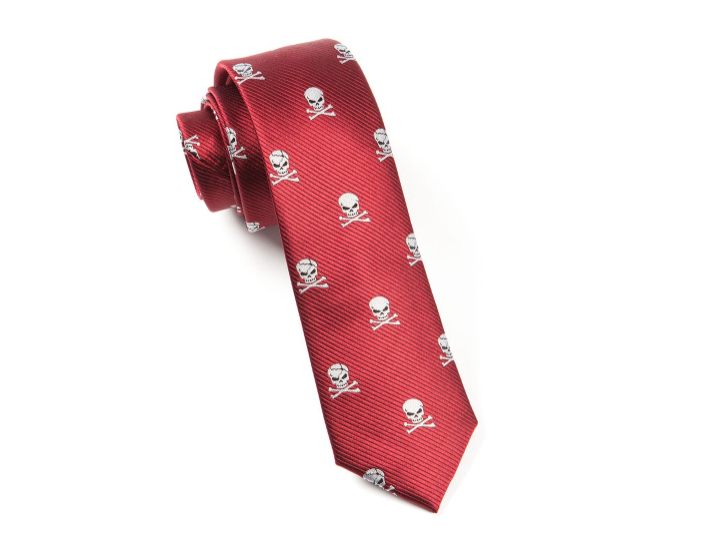 A skull and crossbones tie or bowtie to give your next formal look a little extra attitude. Get the tie from Tie Bar for $19. Available in four colors. Get the bowtie for $19. Available in four colors. 33. A handsome silver skull candle with a crimson jawline. Get it from Meltdawn Candles on Etsy for $14.99. 34. A copy of Alexander McQueen: Savage Beauty, which features a lenticular cover that transitions from a photo of the beloved designer's face to a skull illustration. The book details McQueen's career and includes beautiful images of his iconic designs. Get it from Amazon for $28.77. 35. A wine bottle holder nothing can hold a flame to. Get it from Wayfair for $29.99. 36. A skull and flowers laptop sleeve you'll want to take everywhere. Get it from PB Teen for $8.99. 37. A crystal paperweight with an anatomically correct skull injected inside of it. Get it from Ralph Lauren for $89.99. 38. 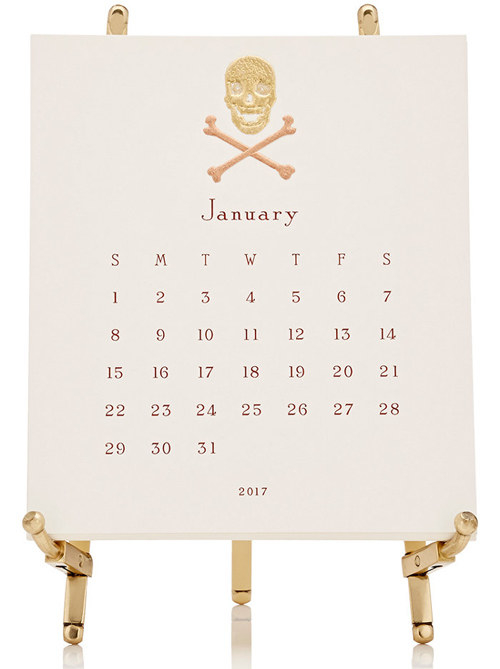 And if you have some major dollars to spend, an ivory and gold skull and crossbones easel calendar will add a luxurious touch to your kitchen counter or desk. 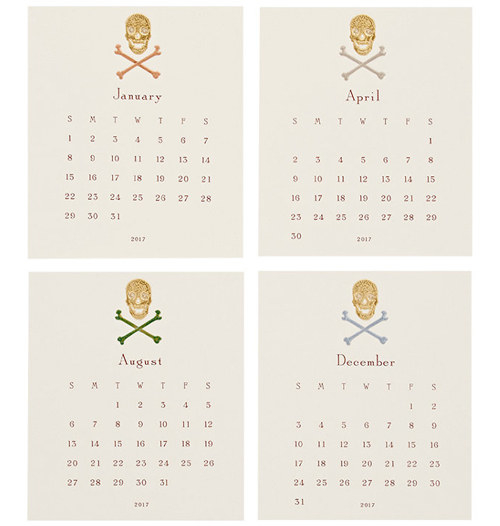 The calendar set includes a brass easel and 12 calendar cards. Get it from Barneys for $135.